I wish, WISH, I had a British accent and this was pronounced, “shed-yewl”. (I literally spent five minutes trying to figure out how I was going to spell that pronunciation.) I also had a teacher from southern Arkansas that prounounced schedule like “skeh-jewww”. Taking a quick cat nap this morning in her Rock and Play. The word “schedule” is only somewhat applicable to anything regarding a baby. If you are expecting to put a baby on a military-like plan, fuggedabaddit. Babies are people, just like us. They have off-nights. They have nights when they just can’t sleep. Just like you and moi. And let's be honest; what works this week may not, probably will not work next week. So take any "advice" (and I use that term verrrrrry loosely) with a grain of salt. So, will what works for us work for your kid, too? Maybe. Maybe not. Experts, we are not. We have been raising a human being for all of four blessed months. You'd be better off to consult a veteran momma, a pediatrician or even your family pet before turning to this blog, I'm sure of it. This is simply what works for us. The following is how we choose to put our daughter to bed, feed her and soothe her. She is ours and the beauty of that is that we get to raise her however we darn well please. You may have a different opinion on how things need to be done and that's fantastic! But right now, this works for us, so we probably won't be changing anything until the routine no longer fits. What is a typical nighttime routine like for Caroline? I work on Tuesdays and Thursdays, but am a SAHM on Mon/Wed/Fri. But, no matter the day of the week, we try to keep her on the same routine. We also do this on the weekends. A nurse told us in the hospital that throwing schedules into the wind on the weekends was the kiss of death, if you ever hope to get baby on a routine. We believed her and her advice has proven itself true. Around 7 p.m., we begin our bedtime routine. 7:00 p.m.- Bath time. This lasts about 20 minutes, or until she prunes, ha! She adores bath time and is a great remedy if she’s having a meltdown, which sometimes happens in the evenings. -Swaddle her loosely, making sure to keep her hands where she can easily free them. Our girl likes to have her hands close to her face, as this is comforting to her. -Turn on the white noise in her crib and turn DOWN the thermostat. She is a hot-natured little thing and doesn’t like a stuffy room. -Turn down the lights in the living room, where she’s being fed. 8:30 p.m.-We carry her to her crib and put her down. She slept the first two months of her life in her Rock ‘nPlay. I would HIGHLY suggest the R&P to anyone. 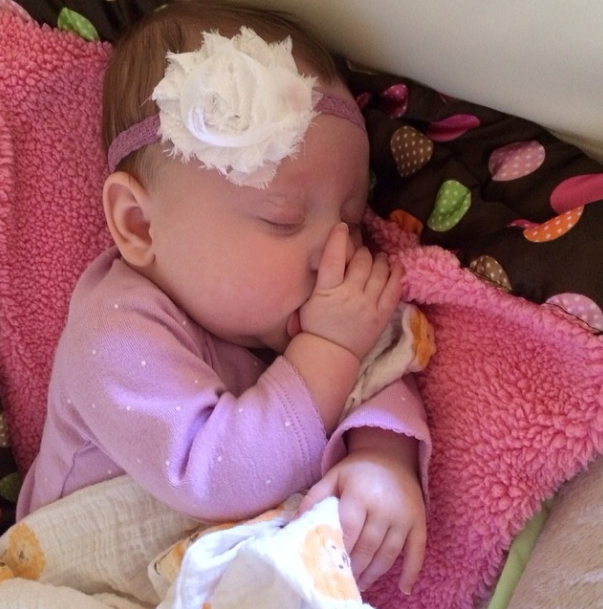 Once she got to two months, we began putting her in her crib for her long nap each day. Eventually, we put her in there for all naps and now, she sleeps 100% in her crib at night. She does like to nap on her activity mat during the day and, occasionally, her R&P. -White noise. We downloaded this app and use the airplane sound to lull her to sleep. -Cool room. I’m not saying to freeze your kiddo, but definitely bump that t-stat down, especially if a baby is swaddled. -Keep the room DARK. Think about it, babies have been in a dark womb for months. We omitted any and all night lights, except for one outside the nursery. -Around three months, babies start to transition to deeper sleep. You’ve placed your baby down for the night and, for the next 45 minutes to an hour, you catch up on some TV with the hubs…when….WAH!!!! Okay. This is normal. Also, it’s likely your baby isn’t really awake. Babies will wake about 45-50 minutes into nighttime sleep as they transition from deep sleep to lighter sleep. You can read more about that here. Sometimes this transition is heard as they literally cry out or whimper. It may sound like they’re waking up, (and sometimes they may be), but really, it’s a transitional moment into the next phase of sleep. Next time this happens, wait two minutes (yep, just two) and see if the crying or whimpering (or babbling) stops. If they truly need to be comforted, definitely go back in there. (Unless you are doing the whole “cry it out” thing.) But you might be surprised that they fall right back to sleep. Caroline usually sleeps from around 8:00 or 8:30 p.m. until 7:30 or 8:00 a.m., but she still has her nights. I wish every night were seamless and perfect, but, well, they aren't. Hang in there mommas and best of luck getting your little one on a sleep routine that works for YOU. This is so helpful! I posted Mallory's "routine" when she was three months old and slowly but surely it is actually looking more like an actual routine. I may try making her room a bit cooler! So glad you guys have been able to get Caroline on a good schedule. A scheduled baby is a happy one! Our schedule seemed to work well for Caleb until right at 9 months. And now, within the last week or two, everything's changed! He's been catnapping during the day (refusing to sleep more than 15-20 min) and crying every time we put him to bed. Thinking we might finally be hitting the teething stage...Ugh! Wish us luck! Easton is on a great schedule and I'm so thankful that every transition has been smooth so far! My only complaint is that he now ( for about the past 2 weeks ) wakes up at 5 AM. We try to keep him awake until 8 but usually by 715 he is out! He must play hard :) Caroline is so cute! Sticking to a schedule will totally pay off for you as she gets older! And that is so true about the transitional moment during sleep…my daughter is 20 months and every night around midnight she cries out haha :) Have you ever heard of the Wonder Weeks app? I never had it for my kids, but my friend loves it. It tells you which weeks your baby might be fussy or going through some sort of growth spurt. My son sleeps like a dream every single night but my daughter's sleep would get disrupted more and I bet it was during the growth spurts. Such great advice, Momma! We always kept it cool in the house at night-they actually say that 65-69 degrees is recommended for SIDS prevention. We also loved our Rock-n-Play and will be using it for Baby #2 as well, that thing was a Godsend! That picture of her is too precious! I love when they use their little finger and hook it on their nose. Sounds like y'all are doing amazingly well! Way to go at putting her on a routine!! The great news (from a mom of a 10 year old girl who basically followed this same schedule) this schedule will stick with them for years to come! My daughter has always gone to bed by 8 and still does! These days, she goes upstairs to shower and read and 8 and is out like a light by 9pm. She can sleep anywhere and just knows that 8-9 is bedtime. So great job to you! I like to say is "sccchhhhed-ule" like Jim Cary in "The Grinch."